Erythropoietin (EPO). When kidney cells sense that the body’s oxygen levels are low, they release more EPO, which stimulates the bone marrow to make more red blood cells to help carry more oxygen to the entire body. So if the kidneys don’t work properly, your body doesn’t get enough oxygen. The result? Anemia. Calcitriol. Your bones need the kidneys to produce enough of this active form of vitamin D (actually a hormone) so that they maintain proper calcium levels. Renin. Not a hormone per se, but an enzyme that eventually produces the hormone angiotensin II. This hormone, in a roundabout way, causes the kidneys to retain more water and salt, increasing blood pressure when it drops too low. The most important thing to remember about your kidneys is that they exist to maintain homeostasis—fluid balance—in the body. For example, if your blood pressure increases, the kidneys kick into gear to excrete more water and salts so that the volume of blood goes down and your blood pressure decreases. If your blood pressure gets too low, the kidneys decrease the amount of water and salts they excrete so blood volume goes up and blood pressure increases. Unfortunately, most people don’t learn about kidney problems until it’s too late, because most kidney diseases don’t produce any symptoms, says Leslie Spry, MD, of the National Kidney Foundation. Chronic kidney disease (CKD)—abnormalities in kidney or urine function for three months or more—has become more prevalent in the past 10 years. The rise in CKD, now the ninth leading cause of death in the US, may correlate with the national increases in diabetes, high blood pressure, and obesity. Why? Because diabetes prevents glucose from breaking down, and the excess glucose can damage the nephrons, the part of the kidney responsible for purifying and filtering blood. Chronic high blood pressure can damage blood vessels throughout the body, including in the kidneys, making it more difficult for the kidneys to remove waste and fluids. Researchers aren’t quite sure why obesity plays a role, but a 2006 study published in the Annals of Internal Medicine found that even people who are moderately overweight are seven times more likely to have kidney failure than their thinner counterparts. The research suggests that obese people are more likely to get diabetes or suffer from high blood pressure, but even more than that, “Obesity places more metabolic demand on the kidneys, forcing them to work harder,” says Chi-yuan Hsu, MD, assistant professor of medicine at the University of California, San Francisco and lead author of the study. 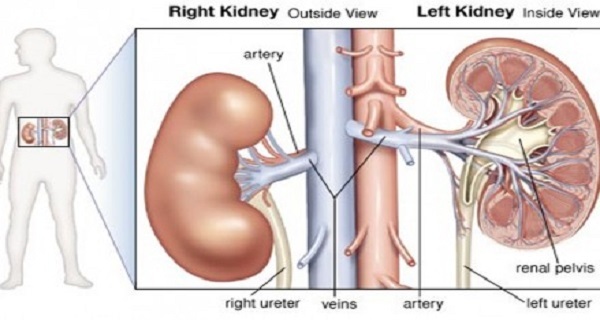 Other reasons for kidney failure include autoimmune disease, taking NSAIDs (nonsteroidal anti-inflammatory drugs) for several years, and inflammation. While you can’t prevent your kidneys from aging (like everything else), you can slow down the process. Of course, the healthier you are in your younger years, the healthier your kidneys will be when you’re old and gray. Here are the Ten Commandments of good kidney health to incorporate into your lifestyle today. Stop smoking. The results of a 2007 study published by the American Physiological Society suggest that nicotine is a major factor in the development of kidney disease. Get your “levels” under control: cholesterol, blood pressure, and blood sugar. Rethink your diet. Avoid soda (especially ones with high-fructose corn syrup, a known cause of obesity and inflammation); load up on organic fruits, veggies, and whole grains; stay away from salty and processed foods; and limit animal products to lean cuts of chicken or fish a couple of times a week. Pay attention to your digestion. Adding pre- and probiotics and additional fiber can aid elimination; steering clear of pesticide-laden foods will put less strain on your kidneys. Avoid pain medications and any other prescription or over-the-counter meds that may tax the kidneys, such as Motrin, Advil, and any other NSAIDs. If you have to use them, even short term, take milk thistle (80 to 160 mg two to three times a day). Get plenty of exercise, including aerobics that will get your heart rate up, five or six times a week. Stay hydrated. Drink at least six to eight glasses of water (preferably filtered) every day. Cut back on alcohol consumption. Overindulgence can increase blood pressure (a problem for the kidneys) and urination (which can cause dehydration). Do something every day to decompress and de-stress, such as listening to music, doing yoga or t’ai chi, or laughing with friends and family. Dandelion: Rich in beta-carotene and high in potassium, dandelion works as a gentle diuretic, as well as a liver and kidney tonic. The roots can be steeped as a tea, and the leaves eaten raw in salads. Or take 500 mg twice a day. Stinging nettle: Taken in tea (1 tablespoon steeped in 1 cup of hot water) or supplement form (follow dosing on the package), nettles are high in chlorophyll, which tones and supports the whole body, particularly the urinary and digestive systems.